New Game Runner's Essentials Courses - Get Your Early Bird Ticket Now! 2 ways to play the game & unlock your next level. Hire a FluencyByDesign™ Game Runner. Or: Become one! As a game runner you hold the game—and the playbook—to create results oriented training, workshops, and coaching conversations with the companies you serve. Cape Town! Join the Agile Abundance Open House Leadership and Coaching day Saturday 24th of November. Click here to Find more details and RSVP. A new quest for Fluency is Embarking Now. Sign up for your ESSENTIALS course and get started! Hamburg, October 31 2018 (1 full-day) Tickets on Sale Now! Inquire about in-house FluencyByDesign Options for your company. See a FluencyByDesign Gamerunner training lab in full action using the Agile Fluency Game. make the focused investments in agility that yield the full, promised return. create effective strategies and engaging interactive training to help agile teams understand their agile progress and power-up to unlock business results only available on the next level. own your knowledge of best practice, and secure business investment in paying down technical debt. Using the Agile Fluency Game, create Your Own playbook to unlock your best results. When your game is real. What are the Essentials of Gamerunner Training? a powerful simulation that delivers stunning and actionable insights about the long-term progression of agility and the shifts in leadership, coaching and development practice required on your real-life quest for fluent agility. and build your playbook of plays that will allow your real-life teams to tune performance—identify plays for creating a winning digital business centered on product and market value. new conversations about the long-term progression of agility by playing your own boardgame sessions using the Agile Fluency Game that you receive at the end of this workshop—start shifting the conversations about agile product delivery for astonishing results. Smile. Everyone says, "And there's more..."
In this case it's very true. 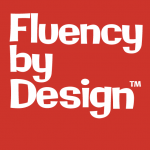 The FluencyByDesign Essentials form the basis of all FluencyByDesign training. It's always your point of embarkation. And, there's more... for advancing professional coaches and leaders, the Essentials are your new, new jumping-on point on your quest for fluent agility. Everyone who embarks on the Essentials goes home with a fluency board game and the basic facilitation skills to start conversations—with nearly anyone— about fluent agility. And for a lot of people, that's exactly what you need. You can be happy, because that's enough! Not everyone tells you that! How Far are you prepared to Go? Choose the learning option to match your goal. Learn essential secrets of agility and your quest for fluency. Comprehend how agility develops in every organisation—like you never have before. Start new game changing conversations— using your new Agile Fluency Game simulation. Build The Agile Fluency Game into your coaching and training. Help your organisations "level-up" and capture those next-stage benefits. + mini-quest homework between sessions. You're definitely not too late to join new quests embarking in August from San Diego and Zurich! Practice the skills, use the strategies you've learned, to build your fluency and reach your goal. Build useful objectives, metrics, and measures to optimise value. Use proven fluency benchmarks that guide teams–and entire organisations-to the win. You've learned the applications, become fluent with practice. Fluency is a great way to gauge, predict, promote, and actually achieve mastery! Your benefits from modern agile development come from mastering—gaining fluency in—the craft of business, product, and software development. A fluency model asks you to choose your target and aim directly for the real benefit that you actually need—rather then some idealised goal of what you should want. A fluency model encourages you to appreciate and celebrate the benefits you are receiving right now from your in-progress transformation. A fluency model shows you how to create the practices, learning, and transformational shifts which are proven to take people to their target. 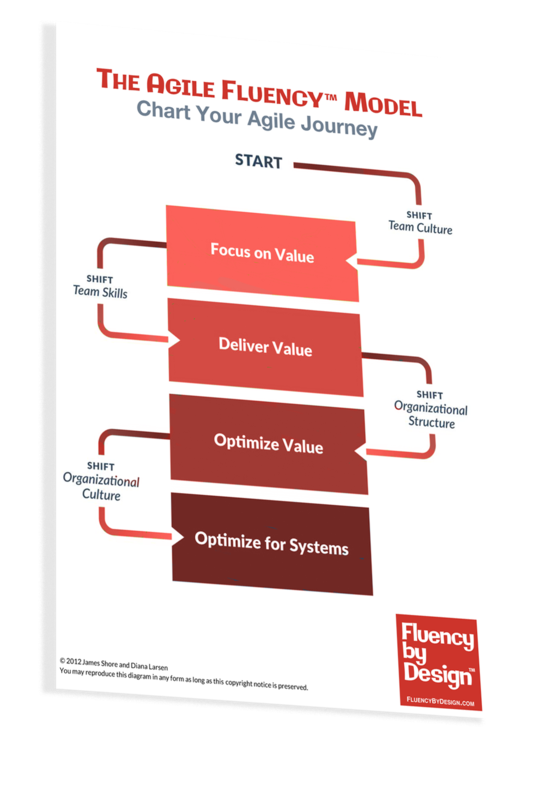 The Agile Fluency Model is a fluency model for teams that produce software products in an agile way. It was created by leading agile practitioners working in the field to deliver real products with value. The model reflects our observations of predictable & measurable signposts that all agile teams mark in their own unique quests for mastery. Our observations have been validated by 1000's, of practitioners and teams around the world since 2012—through benchmarks, interviews, and other anecdotal research. ... to create abundance and transformation in your business? Start here with the Essentials Gamerunner training, and develop proven ways to effectively lead and coach Agile teams. Or own your best practices as a developer or tester. Finally, learn to apply the Agile Fluency Model in practical and pragmatic ways. When leadership knows what to invest in business agility, the teams power-up to unlock achievements only available on the next level. Your ticket price is determined by the Adventure Options you choose and the location where you embark. Your learning adventure always begins with a live, face-to-face ESSENTIALS workshop so you can learn the Agile Fluency Game. Please select the session date and location to join your ESSENTIALS training session. Learn essential secrets of agility and your quest for fluency— using your new Agile Fluency Game simulation. Learn essential secrets of agility and your quest for fluency—using your new Agile Fluency Game simulation. Practice the skills and use the strategies you've learned, to build your fluency and reach your goal. Use proven fluency benchmarks that guide teams–and entire organisations-to the win. Thank-you for your interest in the CREATIONS package! This is a full leadership and training program that's the best way to quickly immerse yourself in the learning you need to win the game. This is a new program and we need to have a conversation about the package price. Use the contact form below to to send me a message so we can discuss the package! But! If you are eager to begin, all CREATIONS packages include the APPLICATIONS package. If you want to secure your place and guarantee your early bird discount, ... go back and select the APPLICATIONS package. Simply book your applications package now. On the next page there is a place to enter comments ... simply indicate you want to discuss an upgrade to creations. We'll make that work. :). Get the Worm! Take a 10% Early Bird Discount! You'll complete your order on next page where you'll enter your billing details—and apply any invite codes to get your final total. Are You Taking Part in the Quest? Yes! This is my registration, I will take part in the training sessions! No, I've entered the participant's information above, but you should use a different email for the billing contacts. The invoice will be issued to the (optional) company listed above unless you enter another company name here. Please be sure to enter your Street Address, City, Post Code, and other applicable identifiers as they commonly appear in your region. Almost ready! Please review your order ... and apply any invite, discount, or coupon codes. Enter your billing address and other registration details and send registration. You will not be asked for payment details, and you will not be charged at this time. As soon as you submit your registration, we will begin your personal registration process. You will receive an invoice within 48 hours. You will be able to pay your invoice by credit card or wire transfer. Please note: your registration will not be guaranteed until we have received your full payment. Please contact Steve Holyer at workshops@fluencybydesign.com if you have questions or need more information. You will be paying in Swiss Francs. Email Steve Holyer at workshops@fluencybydesign.com. © 2017, 2018 Steve Holyer and FluencyByDesign. All rights reserved. FluencyByDesign.com is owned, operated and maintained by Steve Holyer of Steve Holyer and Associates. FluencyByDesign is a trademark of Steve Holyer and Associates.